This post is sponsored by Silpat! All content and opinions are entirely my own. 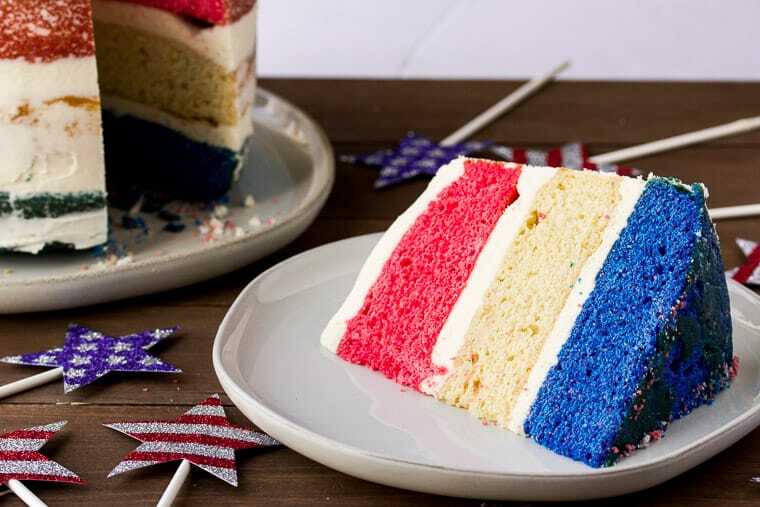 This three-layer Red, White, and Blue Cake is perfect for celebrating all things patriotic! 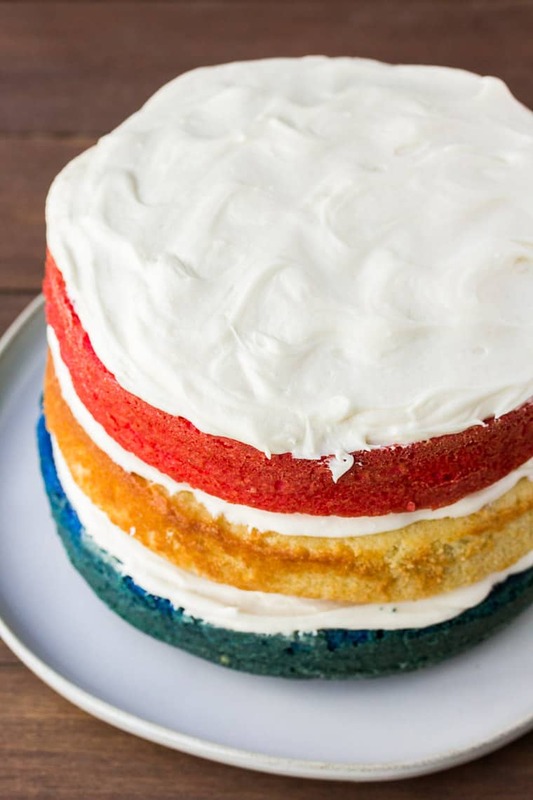 Switch up the colors and this delicious vanilla cake recipe can be used for any special event! When my oldest son was just a toddler, I decided I wanted to teach myself cake decorating. I was obsessed with baking shows and competitions and thought for sure I’d be able to pick it up, no problem. They make it look so easy! But, it isn’t easy. At all. And, so all my fancy decorating tools sit in a box under my cabinet in case one day I get motivated again. These days, I stick to somewhat easier methods of baking and decorating. 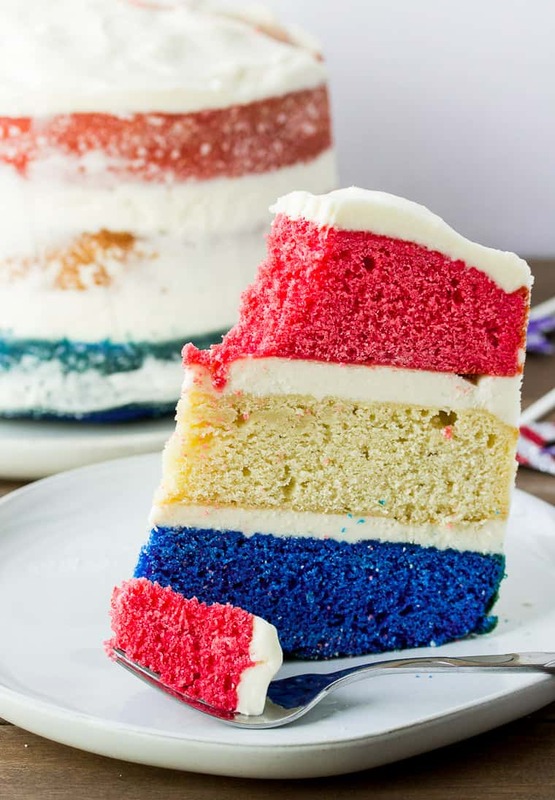 And while this Red, White, and Blue Layered Cake may look a bit challenging, it’s actually pretty easy. 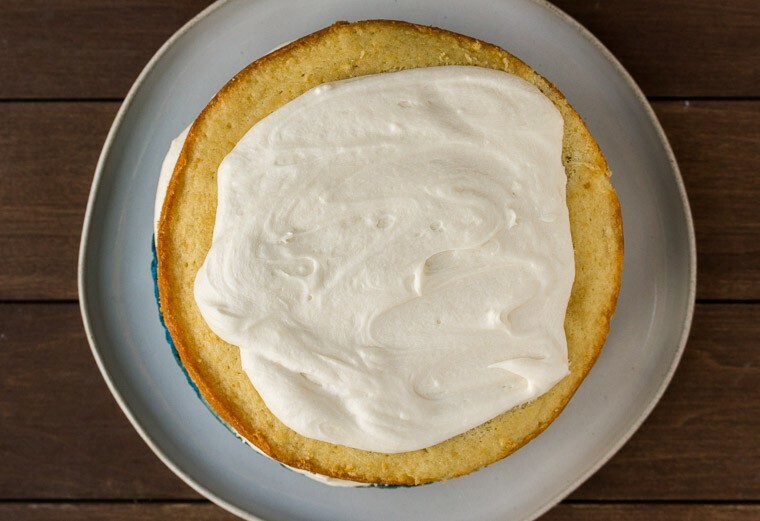 Two things make baking and decorating this cake even simpler – Silpat 8-inch Round Cake Pan Mats and a super easy icing technique. A cake with this type of icing is often referred to as “semi-naked cake” because the sides have very little icing. What is a Silpat Mat? A Silpat mat is a reusable, microwave and oven-safe baking mat. It’s made of fiberglass mesh and food grade silicone. Using a Silpat mat replaces the need for parchment paper in baking recipes, although it is recommended to grease and flour the sides of the pan. These mats can be used for baking at temperatures up to 500°F! They can also be used in the freezer, if needed, at temperatures as low as -40°F. Silpat mats provide consistent heat distribution for even baking and browning. I have been using the cookie sheet size Silpat Mats for years! Cookies just slide right off! 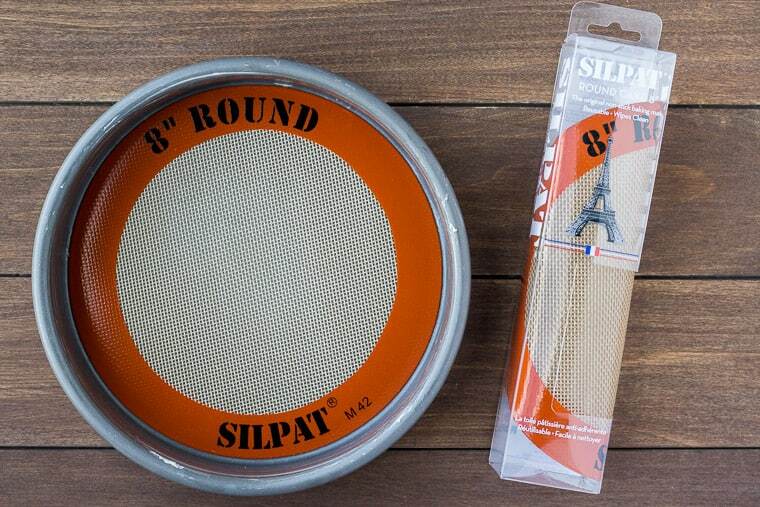 I was more than happy to see that Silpat has 8 and 9-inch round cake pan mats too! Silpat products are FDA, NSF, and Kosher certified. Once you try Silpat baking mats, you won’t want to bake without them! You can find the Silpat Round Cake Mats at Sur La Table and on Amazon.com! Set your butter out ahead of time to let it come to room temperature. This is really important, because if the butter is too cold it won’t distribute evenly into the batter. Grease and flour the sides of your cake pans. Place the Silpat mats into the bottoms. 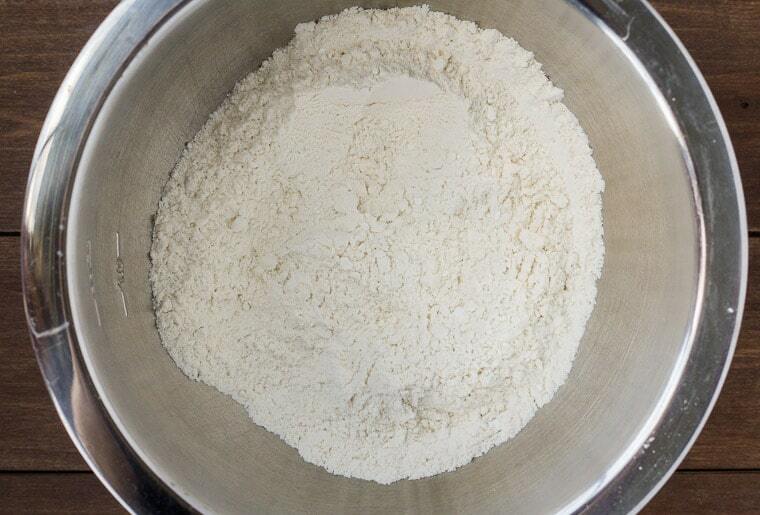 Add the flour, baking powder, and salt in a large bowl and mix until well combined. In the bowl of an electric mixer, add the sugar and butter. Beat until well blended and creamy. Add the eggs, one at a time, then the vanilla extract. Slowly add the heavy cream. Gradually add the flour mixture, about 1/4 Cup at a time, letting each cupful fully blend into the batter before adding the next. Beat on medium speed until the batter is smooth. 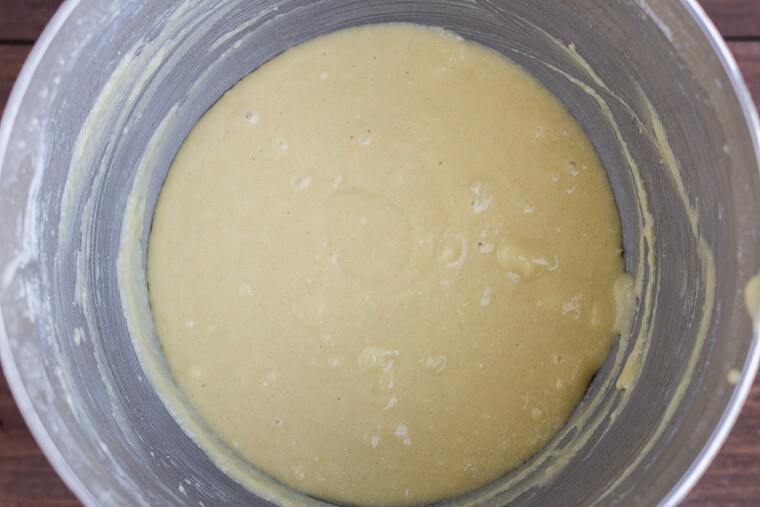 Divide the batter into 3 equal parts. If you are using food coloring, now is the time to add it and mix each batter until the color is nicely blended. Bake for 28-32 minutes, or until a toothpick inserted into the middle comes out clean. Allow the cakes to cool in the pan, then carefully remove to a cooling rack. Make sure the cakes are completely cool before adding the icing. TIP: refrigerating the cakes before applying icing will help keep crumbs to a minimum. Naked and semi-naked cakes are pretty popular lately, so I decided to give semi-naked icing a try myself. It’s pretty easy to do, but if you prefer a traditional icing, see the notes section on the recipe card below. There you will find the adjustments needed for the extra icing. 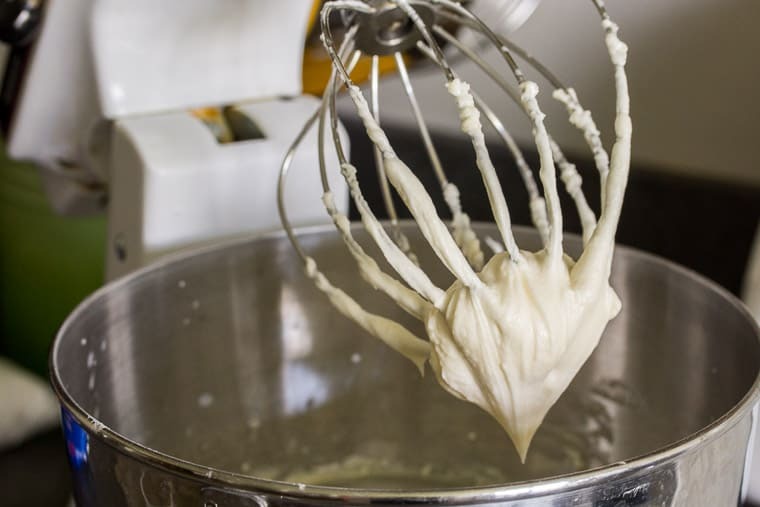 Make the vanilla buttercream icing by adding the powdered sugar, butter, milk, and vanilla to a medium mixing bowl. Beat on low speed at first, then medium speed until smooth. To icing the cakes, place the first cake on a plate or cake stand. 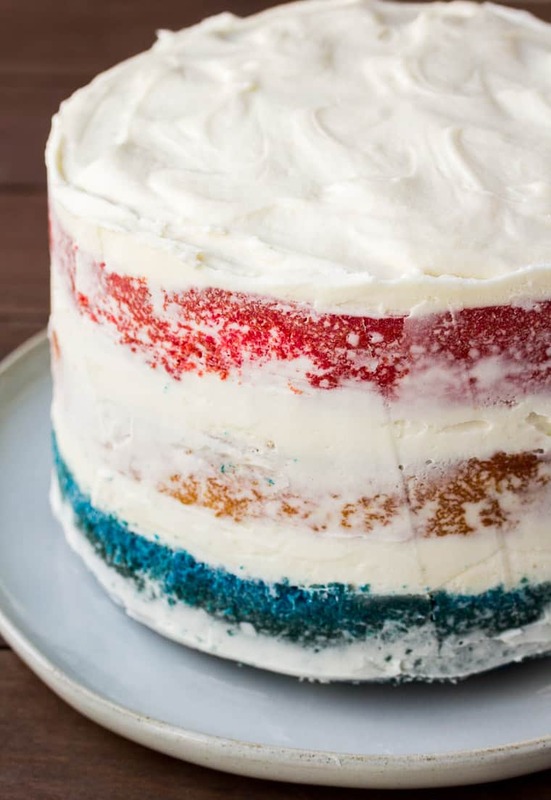 I used the blue cake as the base so my cake would be red, white, and blue from the top down. Add 1 cup of the vanilla icing to the top and spread evenly to the edges of the cake. Place the second cake on top of the first and add another cup of the icing and spread that out to the edges of the cake. Top with the final cake and add another cup of icing to the top. Spread evenly out to the edges. At this point, you have yourself a naked cake. But, we are going to take things one step further and add a little icing to the sides. Apply the remainder of the icing to the outside of the cakes. It doesn’t have to be neat, as you can see in the photo above – most of this will be scraped off. Use a bench scraper to remove the excess icing from the sides of the cake, as you turn the plate or cake stand. 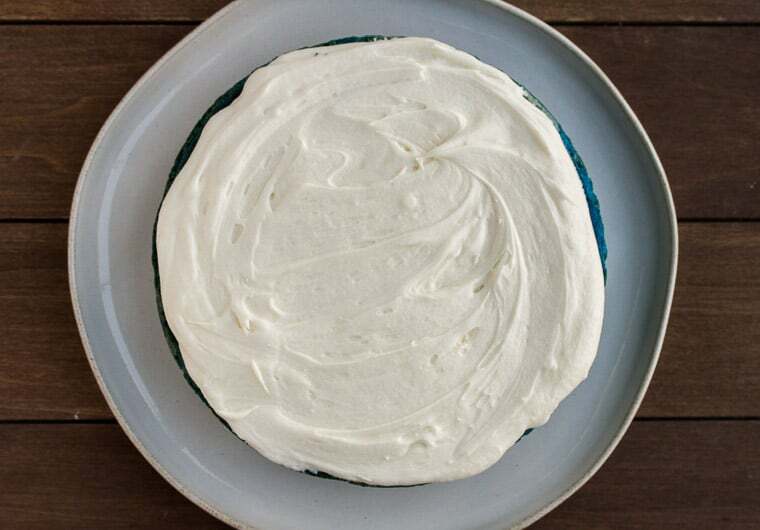 Wipe off the excess icing as you go until most of the icing is removed to your liking. Another tip: a chilled cake will result in a cleaner cut and the icing between the layers will keep it’s shape better, so if possible, keep your cake in the refrigerator until you are ready to serve it. 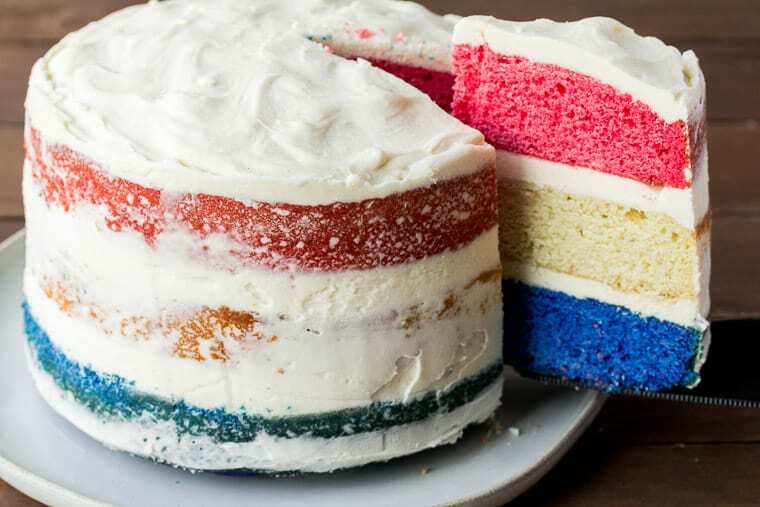 Love this Red, White, and Blue Cake with Naked Icing? Follow us on Pinterest, Instagram, and Facebook for more! PREP: Set your butter out ahead of time to let it come to room temperature. Grease and flour the sides of your cake pans. Place the Silpat mats into the bottoms. Preheat your oven to 350°F. Combine the flour, baking powder, and salt in a large bowl. Mix until well blended. Gradually add the flour mixture, about 1/4 Cup at a time, letting each cupful fully blend into the batter before adding the next. 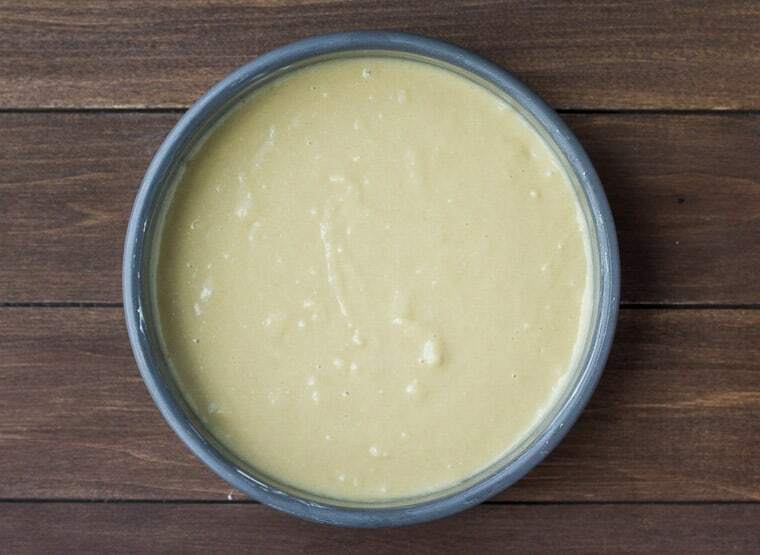 Beat on medium until the batter is smooth. Pour the batter into the prepared cake pans and bake for 28-32 minutes, or until a toothpick inserted into the middle comes out clean. Allow the cakes to cool in the pan, then carefully remove to a cooling rack. Make sure the cakes are completely cool before adding the icing. TIP: refrigerating the cakes before applying icing will help keep crumbs to a minimal. To icing the cakes, place the first cake on a plate or cake stand. Add 1 Cup of the vanilla icing to the top and spread evenly to the edges of the cake. Top with the final cake and add another Cup of icing to the top. Spread evenly out to the edges. 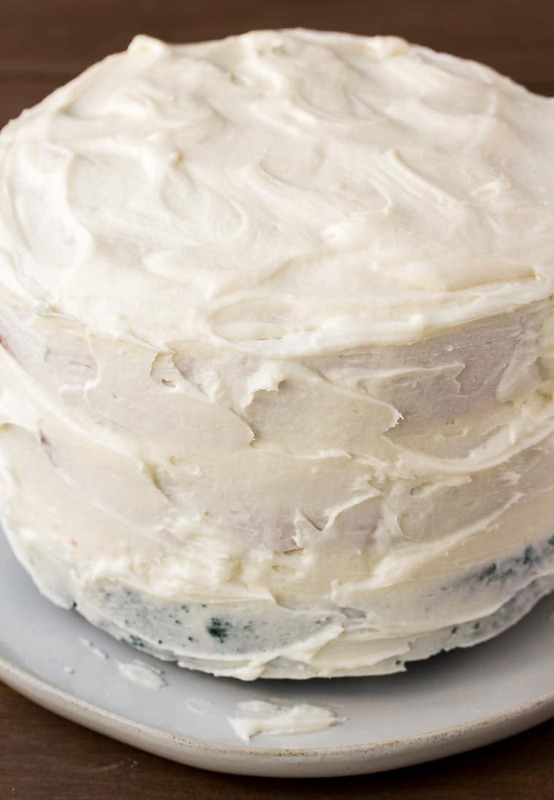 To make a semi-naked cake, apply the remainder of the icing to the outside of the cakes. It doesn't have to be neat as most of this will be scraped off. Use a bench scraper to remove the excess icing from the sides of the cake, as you turn the plate or cake stand. Wipe off the excess icing and repeat until most of the icing is removed to your liking. Decorate as you wish and enjoy! 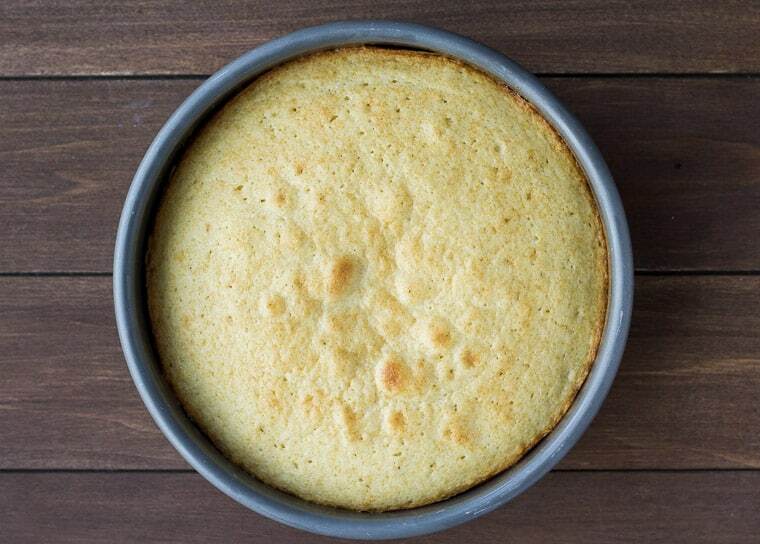 use reusable Silpat Round Cake Pan Mats instead of cutting parchment paper to help prevent your cake from sticking. You will still need to grease and flour the sides of the pan. a chilled cake will result in a cleaner cut and the icing between the layers will keep it’s shape better, so if possible, keep your cake in the refrigerator until you are ready to serve it. ** Nutritional information is given as an estimate only and will vary. I absolutely love this cake! So perfect for the 4th! Definitely making this one! 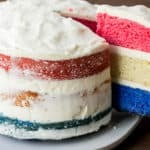 So funny, I’m building the same red white and blue cake right now but going to thin layers so I can stripe the RWB twice! I hope my blue turns out as bold as your’s did. The blue inside came out great – good luck! Silpats are the best. I have used a rectangular one but not a cake round before. That is going on my must have list. That cake looks amazing. 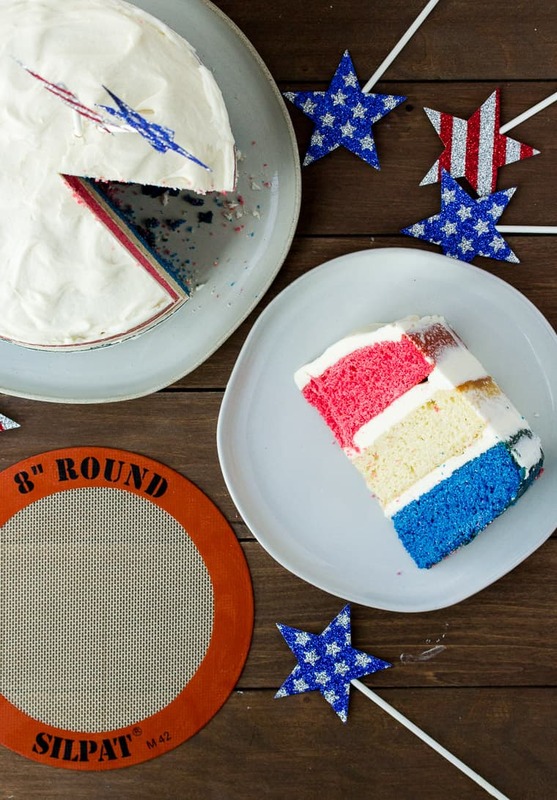 Bold colors and liberal frosting – my favorite! Yes, I have had 2 rectangular ones for years. I don’t bake without them! Definitely try the cake rounds! Thank you! I was my first attempt and was easier than I expected! This is such a fun, festive dessert! I need to try that Silpat mat. Silpats are definitely game changers! Thank you!